Japanese windflowers or Japanese Anemone (Anemone x hybrida). 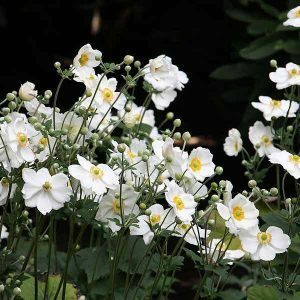 With tall stately flowers late into spring in white or pink, Japanese Windflowers come in a number of varieties such as the white flowering Anemone x hybrida ‘Honorine Jobert’ a single flowering cultivar, ‘Bowles Pink’ with its pretty pink flowers. These plants spread by underground runners and are best contained, some people use them as a ground cover, but remember not to let them ‘get away’ as they can become a little invasive if left to wander as they will smother smaller plants fairly quickly. Plants are readily available for sale from Nurseries and Mail Order Nurseries. These plants come to the fore in autumn, masses of flowers on tall stems. For such a hardy plant, they put on a very elegant show for months. They are easy to grow from Melbourne to Sydney, and aslo thrive in Hobart. A fantastic autumn flowering plant, in fact Japanese windflowers will flower from summer to early winter depending on conditions. 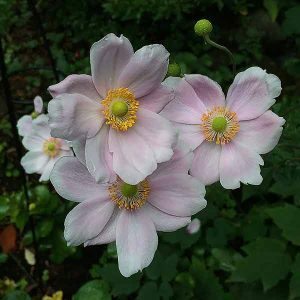 Preferring a humus rich moist soil Japanese Anemone or Japanese wind flowers do well in part shade. They will grow to 1.2m depending on cultivar and have either pink or white flowers, doubles are also available. Look for ‘Red wine’ with great red flowers. Wind flowers can be pruned to the ground in winter when the foliage starts to deteriorate. We provide very little extra care, they are never watered, and rarely fertilised. They thrive on the neglect, and reward us reliably every autumn. They grow well in part shade, and can be used in some of those more difficult positions in the garden.